Klément Julienne is the brilliant programming/production/writing team of David Dahan and Joseph Guigui. Together, they create irresistible music – smooth, eclectic dance grooves with infectious hooks - balanced with sensuous vocals and the dynamics that only live bass, guitar, keys, horns and percussion could provide. Utilizing unique production techniques with exquisite results, the pair has concocted a cosmopolitan, jazz-influenced soundscape on their full-length debut. The appropriately titled Panamerican is a confident and stylistic confection that gleefully traverses boundaries both musical and geographical. 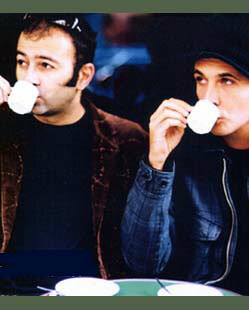 In 2002, while still working on their debut album, Klément Julienne received international recognition for their "Possoz Boogie" single after its prominent inclusion on the worldwide hit, Saint Germain Des Pres Cafe 2, a scene defining compilation. More recognition followed upon the inclusion of a new track "Mannix" on Le Maquis’ successful Lounge Story 2 compilation. On their long-awaited debut, Panamerican, David Dahan and Joseph Guigui have reemerged with a refined sound that successfully encapsulates their musical mission. A one-hour vacation from a world too serious, the album pays tribute to the multifarious worlds of jazz and electronic music. It successfully melds filmic Sixties jazz-pop, bossa nova, easy listening ‘loungecore,’ samba, calypso, blues, electronic downbeats and a hint of exotica into a gently simmering musical gumbo. For the recording, Dahan and Guigui assembled a group of Europe’s finest young jazz musicians and vocalists (including noted Jamaican "roots man" Stanley Beckford). By taking them out of their familiar jazz element and inviting them into Klément Julienne’s world of stylistic free association, the group ended up with hundreds of hours of inspired tracks that would be used as building blocks for the final product. After each live session, Dahan and Guigui would work into the night on the electronic assemblage and treatment of the tracks until the final product had been achieved. The result is a sumptuous set combining live dynamics and interplay with electronic innovation, revealing a boundless and fluid artistic statement. Panamerican articulates a deceptively instinctive sound of enormous depth, intricacy and scope. From the opener "Martin," the group seduces you with delicious smoking grooves that blend blues and be-bop with the funky swagger of classic 60’s Motown. "Medicine Man," features the soulful vocals of Cathy Palvair and an updated jazz-pop groove, akin to classics by George Benson and Grover Washington Jr. Dueling trumpets lead the loungecore anthem "Possoz Boogie," which recalls works by Saint Germain and Koop. "Mannix" is another standout, with its vintage soul-jazz swing and heady production. Other highlights from the 13-song set include: the hazy summer romance "Pamela" (where Martin Denny’s pastoral exotica intersects with Bent’s modern-meets-retro electronic innovation), the intoxicating "Roi De La Batt" (reminiscent of Mr. Scruff’s international signature hit "Get A Move On"), the Afro-Calypso-Samba shuffle "Furia A Bahia" and the bouncy ragga-infused jam "Jerko" (featuring Stanley Beckford’s commanding vocalizations).